Frame Vision Light is a permanently tensioned projection screen that achieves an optimal flat viewing surface. The Frame Vision Light has a clever construction that makes it easy to assemble the 5 cm wide frame profiles and attach the screen surface. 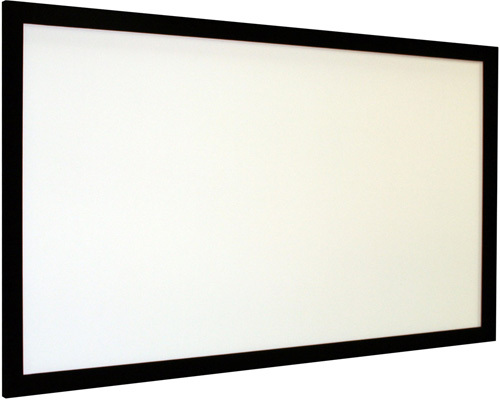 Easy-mounted wall brackets to hang the complete screen onto are included. The frame design puts equal tension on each part of the viewing surface, making it perfectly smooth. The light-weight black aluminium border frames the projected image nicely. For an even more fantastic viewing experience, the Vel-Tex® option is highly recommended. The Vel-Tex® option is a true black, velvety textile covering on all of the frame parts. Not only does the Vel-Tex® give the screen a more luxurious impression and conceals all trace of joints in the frame; it is also more forgiving to any incorrect adjustment of the projected image since every small edge of the images beyond the inner frames are visually absorbed by the Vel-Tex®. At the same time it helps to cut reflection from surroundings lights. Please note: The surface is sensitive to heat and are not suitable as black-out, or sun protection. Do not install close to heat sources like radiators, amplifiers or turned on TV-sets.